One mile east of N.H. Route 12A on Root Hill Road at the foot of Dingleton Hill in Cornish over Mill Brook. The bridge is 77'9" long with a clear span of 62'6". It has an overall width of 16'4" with a roadway width of 12'9" and a maximum vertical clearance of 10'5". A cross beam (tell-tale) has been erected at each approach at a height of 7'6" to block high vehicles. The bridge is posted for six tons, passenger cars only. The bridge was built by James Tasker who is known to have built at least eleven bridges in the area. It was assembled in a schoolyard and then transported to the site. The farmers who used it would occasionally repair it. Milton Graton restored it in the summer of 1983 at which time he repaired the stone abutments and leveled the bridge. He also installed new bearing shoes, new plank flooring and sheathing, some new components, and repaired the roof. 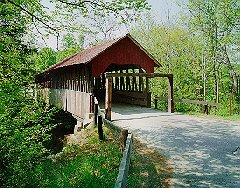 The cost of rehabilitating the bridge, in combination with the Blacksmith Shop covered bridge, was $30,000. The cost of restoration was made possible from a federal Historic Preservation Fund matching grant from the National Park Service of the U.S. Department of the Interior through the New Hampshire Division of Historical Resources, the Putnam Foundation, the Cecil Howard Charitable Trust, the Eva Gebhard-Gourgaud Foundation, and the Town of Cornish. The bridge was rededicated on October 23, 1983 with Hyland Tasker, a great-grandnephew of James Tasker in attendance. The Dingleton Hill Bridge is listed on the National Register of Historic Places.